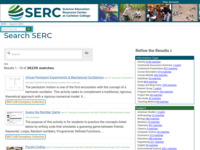 A variety of course descriptions are available through SERC websites. The resources include descriptions, syllabi, and other information and materials that encompass a wide range of disciplines and grade levels. 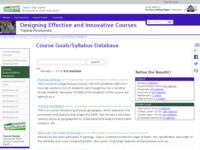 Course Goals/Syllabus Database - From On the Cutting Edge, this browsable collection of over 200 courses provides syllabi and other information for courses with a wide range of topics and grade levels (which users can narrow them down by): biology, environmental science, geography, geoscience, and mathematics; high school to graduate/professional grade levels. 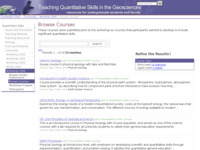 Geoscience Courses Incorporating Quantitative Literacy - From Teaching Quantitative Skills in the Geosciences, these courses were submitted prior to a 2006 workshop as courses that participants wanted to develop to include significant quantitative skills. Search for Geoscience Course Profiles - From Building Strong Geoscience Departments, these 11 course, curriculum, or program profiles were submitted by participants in a 2007 workshop connecting geoscience courses to the future of science. Teaching the Process of Science - From Pedagogy in Action, this collection of course descriptions and activities allows users to browse over 30 courses (and more than 40 activities) that incorporate teaching the process of science in biology, chemistry, education, environmental science, fine arts, geoscience, and physics. Users may narrow the search by topic. 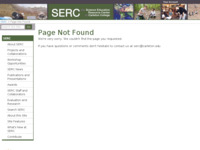 Search Course Descriptions in SENCER - From Science Education for New Civic Engagements and Responsibilities, this collection of over 100 course descriptions covers a wide range of topics: American studies, biology, business, education, environmental science, geoscience, mathematics, political science, psychology, and sociology. 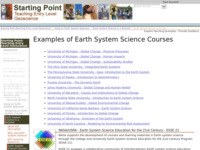 Earth System Science Courses - From Starting Point, this list links to 15 Earth System Science course descriptions from various universities as well as provides links and information to larger collections of information about Earth System Science. 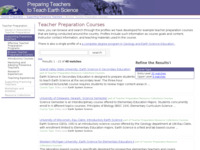 Teacher Preparation Courses - From Preparing Teachers to Teach Earth Science, this site allows users to browse and search through the profiles we have developed for example teacher preparation courses that are being conducted around the country. Profiles include such information as course goals and content, instructor contact information, and teaching materials used in the course.